Two-phase thermosyphons are passive refrigeration devices that transfer heat against gravity. Construction is typically a closed ended tubular vessel charged with a two-phase working fluid. The vapor phase of the working fluid fills the majority of the interior of the vessel, with the liquid phase filling the minority of the volume. Thermosyphons function because of the two-phase working fluid. The working fluid is contained in a closed, sealed vessel (Thermopile or Thermoprobe) that is partially buried. Thermosyphons have typically functioned passively in cold climates during the winter months, at which time the above-ground portion is subjected to cold ambient air which cools and condenses the working fluid. The condensed fluid gravitates to below-ground level. 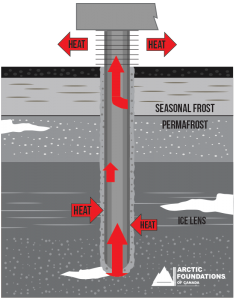 Below ground, subjected to warmer temperatures, the working fluid warms, vaporizes, and rises upward to repeat the cycle. This continuous recycling is irreversible because the cycling ceases in the summer when the air temperature is above the soil temperature. This closed two-phase process should not be confused with the open two-phase process whereby liquid nitrogen is used in ground freezing applications. The latter process simply releases the nitrogen gas to the atmosphere having gained sufficient heat from the soil to vaporize the liquid nitrogen. A closed two-phase system can also be used in an active mode and is applicable when the ambient air temperature is above freezing. Such systems are termed “hybrid thermosyphons” and are often needed in temperate applications where reliance on low ambient air temperatures is not feasible. A typical system consists of multiple Thermoprobes, an active (powered) condensing unit, a two-phase working fluid, an interconnecting supply and return piping network, and a control system. Thermoprobes consist of an evaporator and a passive condenser section. Coupled with an active condenser, a Thermoprobe functions actively and removes heat from the ground without direct dependency on the ambient air temperature. The hybrid system can function simultaneously in both passive and active modes, when the ambient temperatures are sufficiently low, thereby reducing energy costs. This technology has been in use since 1960 and as such has been utilized on over 900 installations. Most of these applications have been in arctic climates where soil freezing is accomplished passively (i.e. without the use of power). Active-passive “hybrid” systems have been used in climates where low winter temperatures do not prevail. Such systems are normal for temperate climates. The essence of thermosyphon technology is well developed irrespective of the climate it is applied in. AFI has been continuously developing, fabricating, installing, operating, and advancing thermosyphon technology since the corporation’s inception in the early 1970’s. As such, the company has the capability and capacity to apply the technology to most any situation in a very expeditious and professional manner. The technology is well developed and is therefore available for application in real situations – it is not an embryonic technology that needs years of developmental engineering to prove. Improvements of the technology are of course developed with every new project and as techniques improve in-house and in related sectors of the geotechnical industry. Drilling and installation techniques are examples of related technologies that are rapidly advancing, thereby improving the practicality of placing thermoprobes in complex underground configurations.